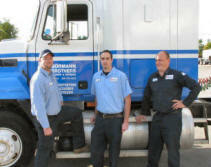 We consider our greatest asset to be the talented, dedicated staff who make up the Bormann Brothers family. More than 40 employees, with 100’s of years combined experience, work together to make each relocation seamless for our clients. We hire and retain only the best full-time professional movers, riggers, and office personnel that the industry has to offer. Many of our key employees have been with us for longer than 10 years. Some have been with us longer than 20. Ours is a family business, and we treat our employees like family. Additionally, we provide ongoing incentives and training sessions to ensure that we truly have the highest caliber of personnel to serve our clients. In short, we choose professionals we would entrust with our own belongings to handle yours.